I don’t get what some people are thinking, especially those who believes they are the big guns, and who does not care about the other species on planet Earth. Who cares about our wildlife, and who cares if they go extinct. The human race is the dominant species, and all other species are second class and should bow down to the humans. It’s the exact same kind of thinking when white men owned African American slaves, or when white people told those of other races to take a seat in the back. People like that still exist even in today’s world. And for this person, he thinks hunting down wildlife in Africa is what humans should do. Who cares if the lions, tigers, elephants, giraffes, or other African species go extinct, they should be hunted down. Walter Palmer is a Minneapolis dentist who paid $50,000 to go to Africa, team up with two people from Zimbabwe, and go and kill a lion for a trophy hunt. He did get his lion, named Cecil, by luring the lion out of a protected national park by using bait, shooting with a crossbow in the night with a spotlight, making the lion suffer for nearly two days after being shot, and finally killing it with a rifle. And oh no, he just left the lion carcass there to rot in the African sun, all he wanted was the lion’s head for a trophy. For starters, why was Walter even hunting an animal that is endangered? We are losing many wild animals across Africa to illegal hunting. And second, he made that lion suffer for nearly two days before he ended the suffering. This is why the entire internet is angry at Walter! Today, only around 20,000 wild lions are left in Africa! And with the way things are going, you don’t have to worry about lions, because they will be gone, along with the other African wildlife. 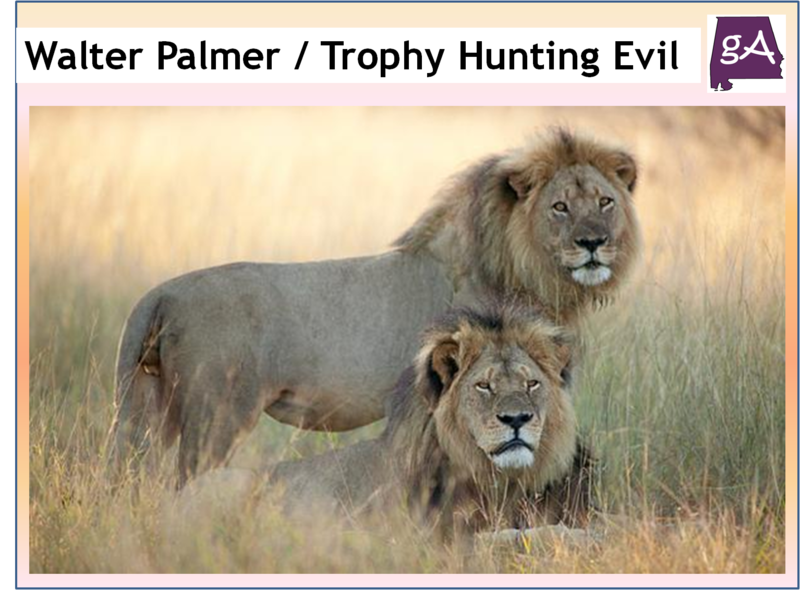 Cecil was not the only wildlife Walter Palmer has killed; he has gone on other trophy hunts in Africa. He has a felony record in the U.S. related to shooting a black bear. He also had to settle a sexual discrimination suit with a former employee at his dental practice. How’s that for a guy who has a way too high ego and thinks that the human race is the dominant race. To make matters worse, Cecil was found skinned and decapitated. The meat from the lion was not even used to feed others, it was just left there. What the made the entire internet angry at Walter was because Cecil was being tracked with a GPS collar, and he was a lion internet celebrity. People also enjoyed seeing Cecil when they went to Africa for a safari. Now, his lion cubs will probably be killed by the next lion male. And the entire world has started a witch hunt against Walter Palmer. His dental office called River Bluff Dental, will never be allowed to be open ever again. Don’t worry about its reputation, because thousands of people have been leaving bad comments on their Facebook and Twitter pages (now taken down), and also many people have been leaving awful reviews on their Yelp and Google Reviews. Yelp and Google are trying to take down the bogus reviews, but that will never work. To save you some time, you might as well take down the site for the dental office, because they will never open again. Protesters have turned River Bluff Dental into a makeshift memorial, and Walter Palmer is nowhere to be found. Oh if someone located him, it might turn out to be ugly, because mostly everyone in America and around the world are angry at Walter, and to anyone else who believes trophy hunting is a good thing to do, it is not! Trophy hunting is something people who don’t care about others do. These people feel like they are macho men, and will do anything they can to please their “human dominance” viewpoints. Let me say I am not against hunting in general, if you have to hunt for food, or hunt to maintain a animal population, like deer for example, than you should have every right to hunt. Trophy hunting should be something that is illegal worldwide! It’s a poor excuse to have a fun activity to do. Walter’s point of having fun is going around and killing innocent animals just so he can have their heads mounted in his ugly home. Well Walter, you should be placed in a forest and have animals hunt you for your head? Would that be fun? There are petitions for Palmer to be extradited to Zimbabwe to face charges and for Zimbabwe to stop issuing hunting licenses. And because of the entire backlash, Palmer sent a letter to his patients. It shows little remorse! At the end of the day, I don’t get why some people feels like they should kill innocent and wonderful animals, which are not dealing with an overpopulation problem and are nearly extinct, and sit right next to the animal and smile in a photograph. Is this because you show little remorse to other creatures? Is it because you simply don’t care about planet Earth and Mother Nature? Is it because you have a mile high ego that needs to be shot down? Or is it because this is your idea for fun? For Walter Palmer, I hope you can find a way to stay out of harm’s way, because your life has changed forever! Maybe this will get you to think about what trophy hunting really is, an ugly way to show the planet who is boss. Maybe it’s time for the planet to show who is really boss, and create a mega disaster that wipes out a bunch of people, since us humans are leading the way to making many wonderful animals extinct. And for you people in Africa, you want to be taken seriously don’t you? Guess what, no one will care about you and your people until you take all steps necessary to protect the dwindling African wildlife. Stop issuing trophy hunting licenses! Have your people protect the precious wildlife at all costs! You must realize this; the number of people who cares about the African wildlife severely outnumbers the people who think African wildlife is there to hunt for a trophy. For people like Walter Palmer, Kendall Jones, and Rebecca Francis, who hosts an American television show called Eye of the Hunter, trophy hunting should be something illegal. And thankfully, people around the world are seeing what trophy hunting really is, pure evil! Social media like Facebook will take down trophy hunting pictures. And if you go on a trophy hunt, prepare for the major backlash! Something is wrong in your head when your idea to get a thrill is to gun down innocent wildlife and cost a life with a high powered weapon. Walter killed a beautiful animal that had done nothing to him. He didn’t kill to survive or for warmth and food, he paid money to feel like a ‘big man’, as if ridding the world of animals is something to be proud of. He killed for fun and if that were a person, we would be putting him in jail for a long, long time. Since he kills animals for fun, could he be showing psychopathic tendencies? I guess people who torture/kill animals are far more likely to get pleasure from doing it to humans, right? Killing a protected animal pissed off a lot of people, even Jimmy Kimmel had something to say about this! I guess trophy hunters think they are above the law and have zero compassion for wildlife. Is that what you think trophy hunters? You are doing a tremendous amount of damage to our wonderful planet. And we don’t have another planet we can go too, once Earth is destroyed, the human race will be gone! There is a reason why Earth has a wide variety of species, in my opinion; this was something God wanted to make sure humans did not feel dominant and greedy. Well I guess God got his thinking wrong, maybe it’s time for God to come back, and correct the imbalance humans are placing on this planet. Maybe the suffering will disappear for good! #WalterPalmer is disgusting. Why do people need to kill other BEAUTIFUL living creatures and then classify it as a "sport"? Disgusting. Ambition, greed and insecurity are the things that move people like #WalterPalmer to kill inocent creatures. Stop Poaching! Agree, awareness must be raised! Thanks for commenting!